Alison over at The Blackberry Garden has written a great post on a plant that has been irritating her, and came up with the idea of Irritating Plant of the Month day (IPotM). See her post for info, and mine below for my first contribution to this new meme. 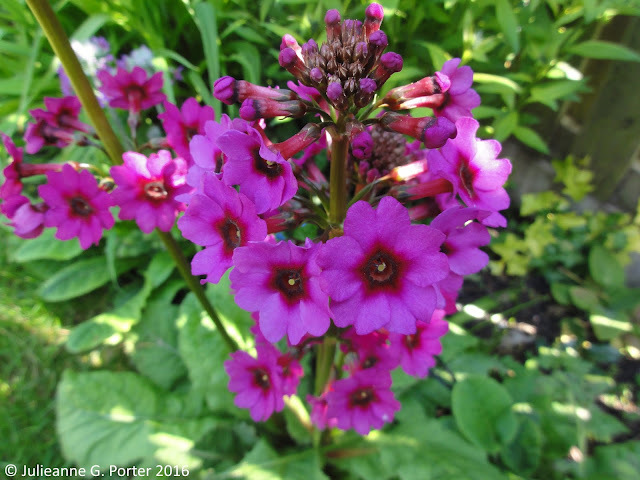 My IPotM is Primula japonica 'Carminea' (Japanese primrose). Why is this delightfully pretty plant irritating me? Because it's in the wrong place! To be fair, it's not the plants fault that I planted it in the wrong place. But it is it's fault that it's grown much taller than I was expecting, instead of .5m, and is more like .8m. And because it's at the front of the border it looks odd, and keeps bugging me. So I need to move it further back into the border, so it's flowers will sit more gracefully amongst the foliage of other plants, rather than sticking out like a sore thumb. So that's my IPotM for June. What's yours? Hi - thanks so much for joining in. Oh the annoyance of a plant in the wrong place! I know it well. What a beautiful plant too. It must be all the rain we've had. And the known fact that plants never read the information printed on their labels.